I walked among the sculptures at Broomhill Sculpture Garden in Devon, England. A huge, rectangular boulder was suspended in the Y of a tree, a group of ghostly white figures circled a tree at the edge of a creek, a horse made of willow pranced through the azaleas, and a mirrored egg reflected the clouds, birds, and my kids who never seem to get enough of their own reflection. The art was interesting, arresting, and thought provoking. 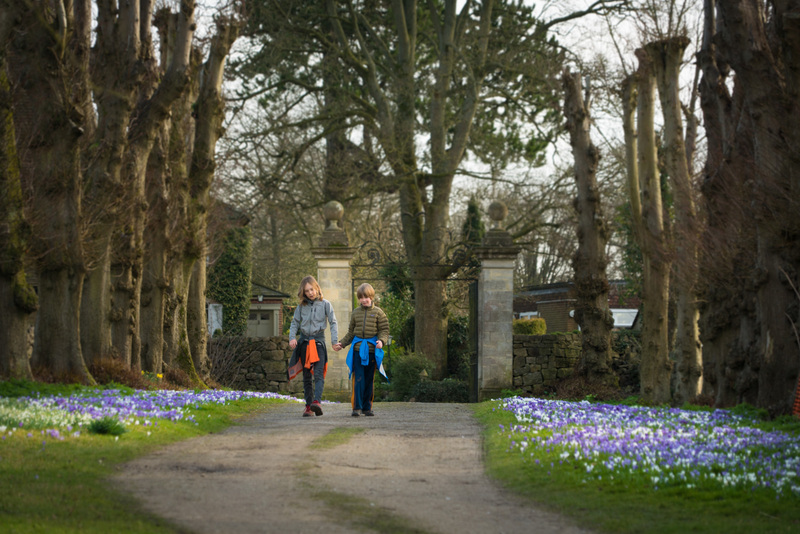 The sculptures are the reason we were strolling through this garden on a sunny February day, but what really grabbed my attention were the flowers – daffodils, snowdrops, primrose, and others. We flew into England on Valentine’s Day, leaving the lovely city of Ljubljana, Slovenia behind. Ljubljana was one of our favorite places in Europe, but the day we left was gray and drizzling. There wasn’t a flower in sight. We landed in London to unexpected greenery and blooms. There was so much green. I pictured a gray, dismal country and was delighted by the color. 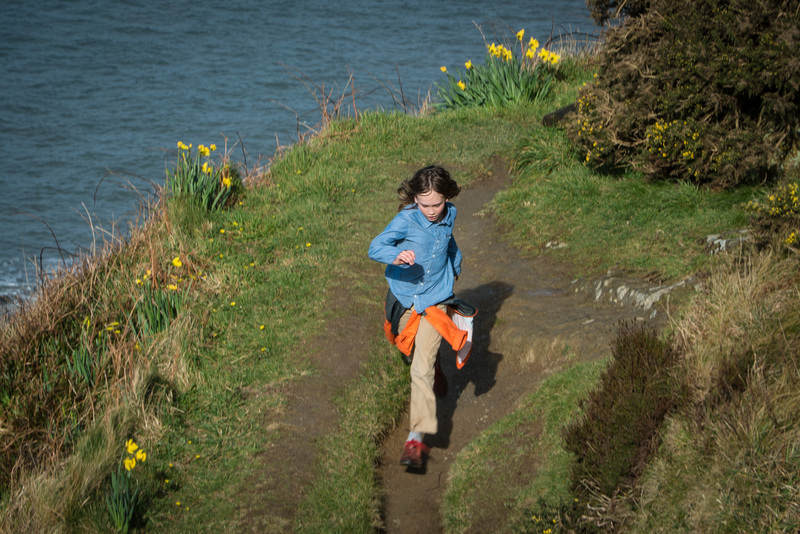 When we arrived in Illfracombe, Devon, it was a celebration in green grass, buttery daffodils, creamy primrose, and sunny gorse. Forget the art and history of this country; all I wanted to do was look at flowers. The Japanese have a tradition of flower viewing called hanami. It refers specifically to viewing the cherry blossoms that bloom for a week or two in spring. Japanese families and friends gather beneath the branches of the cherry trees to picnic, party, and enjoy the transient beauty of blossoms. I can’t think of anything more lovely than celebrating the ephemeral beauty of flowers. I shouldn’t be surprised that the Japanese have a flower viewing celebration. These are the same people that brought us forest bathing – the practice of spending time in nature to benefit your mental and physical health. To take a moment or an hour or a day to soak in nature’s beauty and celebrate the transition of seasons is something I long to foster in my own life. I’ve never been in love with spring or understood the hype. Summer has long days, swimming in the ocean, floating a river, or climbing a mountain. Autumn is all crisp air and colorful foliage. Winter brings snow-laden branches, friends gathered around a bonfire with warm drinks in their hands, and cross-country skiing in the woods. Spring in Montana is cold, gray, and wet. It’s too slushy to ski, too icy to hike, and the steely sky weighs heavy on my spirit. I know there are occasional blue sky days and baby bison, but mostly it’s mud. Gorse along the trail in Exmoor National Park. After spending February and April in the UK, I finally get spring. Bright yellow gorse climbs the hillsides and I sat beneath the spiny, evergreen shrubs practicing my own version of hamani. Gorse shrubs are not cherry trees, but few plants make such an impact on the landscape with their color and scent. Whole hillsides were awash with yellow, like a land-based sun. The odor is said to be reminiscent of coconut, which I didn’t get, but it was pungent. According to folklore, one should only kiss their beloved when the gorse is in bloom. Fortunately, unlike the ephemeral cherry blossoms, gorse blooms almost year round, with its peak in April or May (or these days in March). In spring that the plant seems to be nothing but yellow blooms, so smooch away. 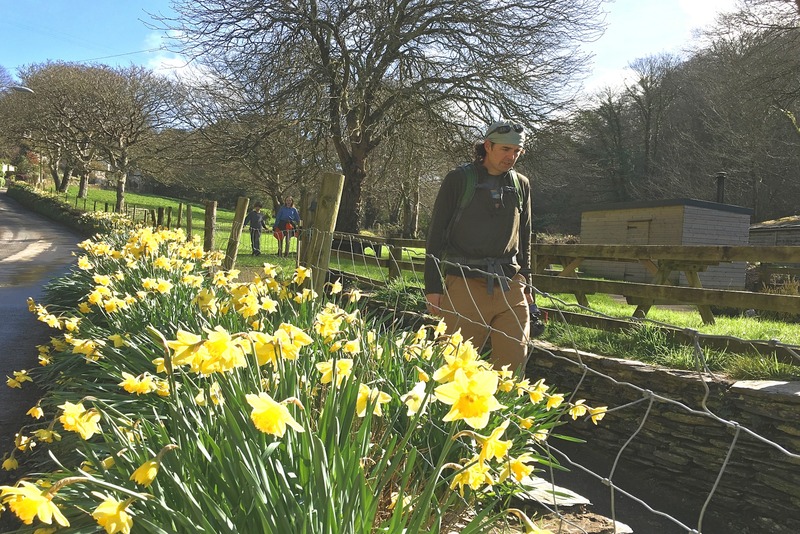 Patches of daffodils on the South Coast Trail between Ilfracombe and Lee Bay. The other prevalent bloom that carpets the UK in spring is the daffodil. I had no idea there could be such a profusion of daffodils until we landed in England. There are wild, ornamental, and hybrid daffodils and they seem to fill every place that gorse or grass were not. The wild or native daffodil often hybridizes with the garden variety and is thus becoming more and more rare. That means there is a little less wild in an already tame country. The wild daffodil is smaller than its garden counterpart, but it is still striking with its pale yellow petals surrounding a darker yellow trumpet. The daffodil is also known as the “Lent Lily,” as it often blooms and fades during the Christian period of Lent. But spring came about a month early the year we were in the UK and I imagine this trend will continue as the climate changes. The Lent Lily may need a new name. 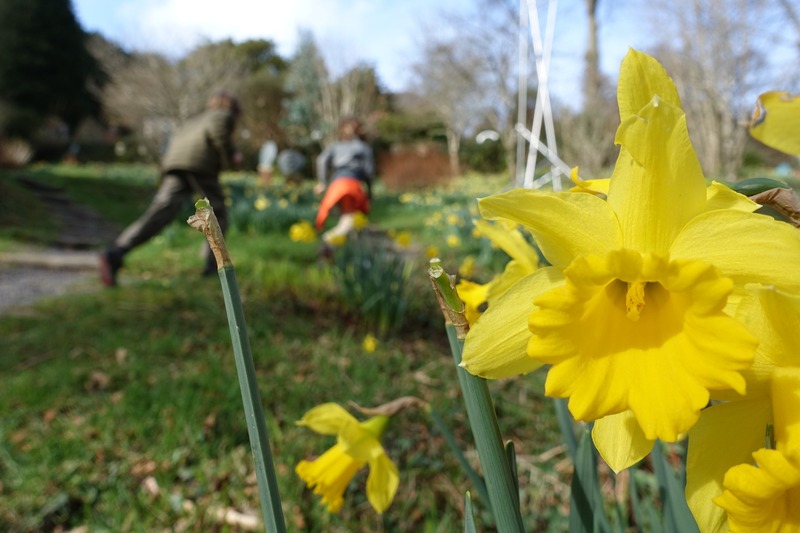 In the Language of Flowers, daffodils represent hope and folly, which best describe spring, a time when baby animals are born, buds burst open, and we pack away our down jackets only to be hit by a cold spell a week later. It’s a cliché to say spring is a time of birth and rebirth, hope and celebration, but it’s true. Even a diehard winter-lover such as myself gets a small thrill from the first blossoms of spring. I plan to adapt the tradition of flower viewing into my spring celebrations (that’s June in Montana), just as we have adopted Scandinavian hygge for our winter rituals. Every season needs a welcome party and a version of hanami combined with forest bathing fits right into my lifestyle. As I walked through the woods, along cliffsides, and across meadows in England, I bathed in nature and appreciated the temporary blooms of flowers. I admired their showy colors and delicate shapes knowing they wouldn’t be around for long. Anyone who hikes with me knows I stop for flowers. Early summer glacier lilies and prairie smoke, hillsides of arrowleaf balsamroot and lupine, meadows of tall, pink fireweed stops me in my tracks. A Calypso orchid hidden in the shade beside a fallen log sends me into ecstasy. I am compelled to name them, gaze at them, and take too many pictures—perhaps in an attempt to make them last longer. There was a lot of picture taking in England. On one of many strolls, we wandered from Ilfracombe to Lee Bay. 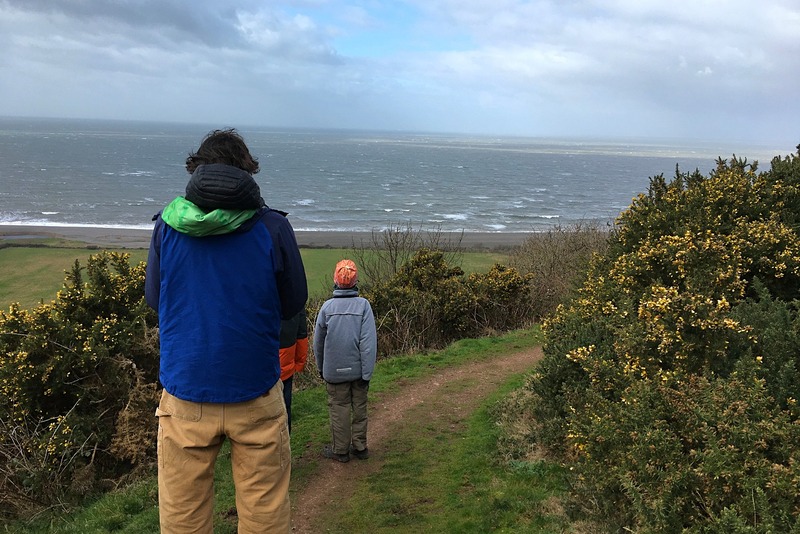 The 10K out and back jaunt follows the South West Coast Path along the cliffs above the Bristol Channel of the Atlantic Ocean. The path crossed green fields kept short by sheep, but even there little white and yellow flowers poked through. Wild or hybrid daffodils popped up on the edge of the trail in shady or protected spots. 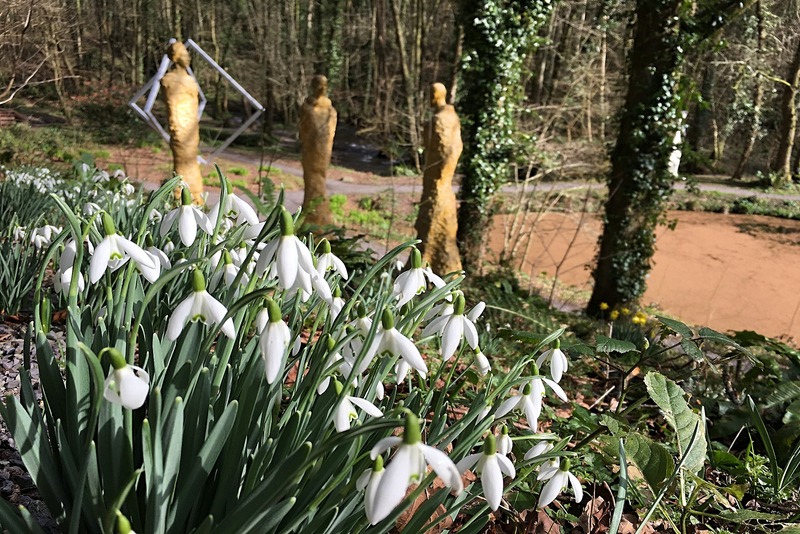 Snowdrops in Broomhill Sculpture Garden steal the show. Snowdrops were another flower that showed up a lot during our British Spring. These iconic white flowers bob on a thin stem when little else is yet to emerge from the cold earth. Like daffodils, they grow from nutrient rich bulbs and can use those resources to sprout early in the season. They are resistant to cold weather and don’t mind a drop in temperatures once they emerge. I especially love that there is a name for avid collectors of snowdrops: galanthophiles for their Latin genus, Galanthus. According to the Language of Flowers, snowdrops symbolize chastity, consolation, death, friendship in adversity, hope and purity. The death part doesn’t make sense to me, but the rest does. 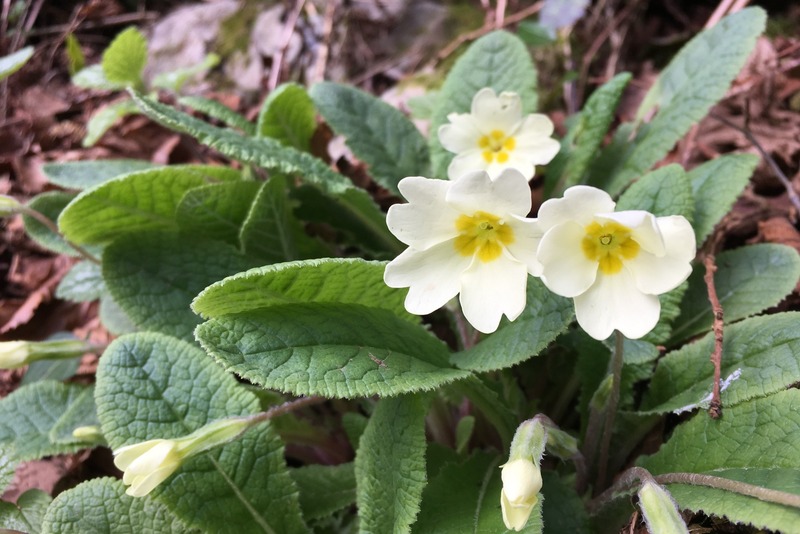 One of the surest signs that spring is on its way is the sight of primroses, the county flower of Devon. These creamy, pale yellow flowers with orange centers graced our stay in the UK. Its name is derived from the Latin prima rosa meaning ‘first rose’ of the year, despite not being a member of the rose family. Wandering the Broomhill Sculpture Garden, I found bunches of primroses in shady, damp spots. The flower seems so British to me, it’s something about the name, I think. Not only do primroses harken the start of spring, they are also an important food source for the rare Duke of Burgundy butterfly in its caterpillar phase. Two and half months in the UK taught me to love spring. Instead of gray skies and slushy trails, I think of gorse, daffodils, snowdrops, and primroses when I think of spring. I’m ready to incorporate a form of hamani into my life and make sure to notice the spring flowers. A fun and beautiful novel that really isn’t about spring, but does feature flowers and floriography (the language of flowers), is The Language of Flowers by Vanessa Diffenbaugh. I highly recommend it.